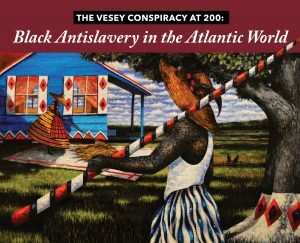 In preparation for a volume of essays to commemorate the 200th anniversary of the “Denmark Vesey Conspiracy” of 1822, the Carolina Lowcountry in the Atlantic World Program (CLAW) at the College of Charleston held a small conference on enslaved and free black anti-slavery, February 8-10, 2019. Karen Salt & Lisa Robinson – Resistance to Memory: Movement Loss, Protest Ghosts, & the Racial Life of Fugitivity. Brandon Byrd (Vanderbilt), Douglas Egerton (Le Moyne), Ada Ferrer (NYU), Samuel Ntewusu (University of Ghana), Manisha Sinha (University of Connecticut-Storrs), and Rebecca Shumway (College of Charleston). James Spady (Soka University, chair). Comment by attendees. Special event: Denmark Vesey’s Garden book event 2:00pm in the new George C. McDaniel Education Center at Drayton Hall. This event is now SOLD OUT! Cost-effective hotel options are also available in nearby Mt. Pleasant, West Ashley, and North Charleston if you have access to vehicle, use taxis or Uber, or you can use Charleston’s public transportation system, CARTA: http://www.ridecarta.com/. Book & Publication display: A publications exhibit featuring works (available for purchase) by conference presenters will be on display in the Addlestone Library. Books may also be on sale in the college bookstore. Acknowledgements: Thanks to the conference planning committee: James Spady, Simon Keith Lewis, Joseph P. Kelly, and Rebecca Shumway. Thanks also to Mary Jo Fairchild, Daron Calhoun, Vincent Fraley, Clare Lorenzo, Tyler Mobley, Carin Rogers-Bronstein, and John W. White. The conference organizers wish to acknowledge the generous support of Soka University of America and especially The College of Charleston for making this event possible.